The Textboom environment has an extensive number of features and options to help you manage your entities and campaigns. You can manage your Textboom account settings by clicking the My Account link in the upper right corner of any page. This page contains two tabs, Change Password and Account Information. Enter your current password into the Old Password field. Enter your new password into New Password field. Re-enter your new password into the Confirm Password field. Click the Save button in the upper right corner of the page. NOTE: We recommend that you use a special character in your password, such as !, @, $, #, %, or & . If you want to change your default language, click the Language drop-down and make your selection. If you like, enter your First Name and Last Name. Optionally, enter your E-mail address and/or Cell Phone number. Choose your Time Zone from the drop-down. An Operating Company (OC) is an account type that provides access for managing multiple Agency and Client accounts. At the Operating Company account level, you can create, edit, disable and delete all aspects of agency and client accounts. An Agency is an account type that provides access to manage multiple Clients. Agency users can create, edit and delete client accounts. The rights and permissions of Agency users is given by the parent Operating Company. A Client is defined is the account type with the lowest level of account access. Client users may only manage only one account at a time. The parent Agency user assigns the rights and permissions of clients. Here we define key terms that are found throughout the user guide. Database – Storage for all records and their respective fields of data. Keywords – Words or combinations of words (without spaces) sent from cell phones to short codes that initiate a campaign, remove the record from the list or request help. Mobile Terminated (MT) – Messages sent from the platform to cell phones. Mobile Originated (MO) – Messages sent from cell phones to the platform. Network Look Up (NL) – A service provided to obtain the carrier supplying service to that particular phone number. QR Code – QR is an abbreviation for quick response. These 2 dimensional squares store encoded data that can be launched when scanned with a smart phone application. Record – a collection of data elements stored in the database. Short Code – 5 or 6 digit numbers to send and receive SMS messages. Short Codes are used because carriers allow a higher volume of messaging. Web Widget – a web widget is a feature that allows users to opt-in to a list on a website. Once you configure the settings, custom code is generated for an embedded or pop-out widget. The Dashboard is a summary page, in which you can view statistical information at the one of several levels: Operating Company, Agency , or Client. At a glance, you may view the amount of MTs (messages terminated), MOs (messages originated), or NLs (network lookups) for each entity. You can easily navigate to find more detail. You can always get back to the Dashboard by using the button in the tool bar at the top of the page. Click this icon to edit the edit the entity (you will exit the Dashboard). Click this icon to disable the entity. A disabled entity cannot be used again until it is enabled. Click this icon to view details for the entity. It is the same as clicking on the entity name (OC, agency, or client). Click this icon to delete an entity. A deleted entity is both disabled and invisible. See the topic toolbar and icons to learn more about navigation to other parts of the Textboom application. You may click on any of the items to access the corresponding feature. Feel free to explore the toolbar and its sub-menus. We have added the ability to disable the opt-out message sent to records after the system receives a STOP message This feature can be located at the Database Set Up Screen (edit an existing database or create a new one to access this functionality), the New / Edit Account screen on the Client, Agency, Operating Company and Enterprise levels and from the My Account link. If a user is subscribed to multiple campaigns on the same short code and sends STOP, the user will be opted-out of all the campaigns on that short code. If a record is joined to a single database, the system will first query the database for an opt- out message. If no opt out message is to be sent, the record will NOT receive the message. If an opt-out message is to be sent, the system will look to the database opt-out message. If a record is opted-into multiple databases, then the system will decide to send or not send the opt-out message as indicated at the level above the account where the databases reside. 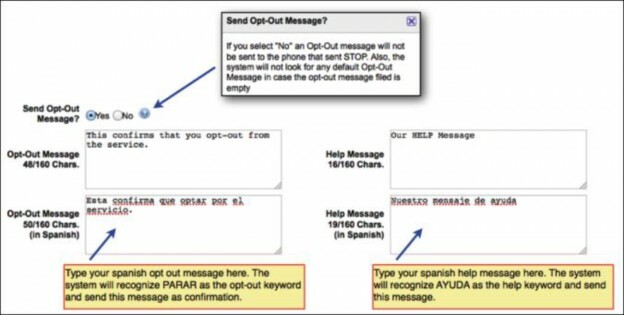 This is a new feature: a Spanish opt-out and help message can be sent when AYUDA (Help) and PARAR (Stop) is sent by a record.